On the face of it the French can count their intervention in the Georgian crisis as a big diplomatic success. As the current holders of the EU presidency, the French were always going to be at the forefront of the EU's efforts to mediate between Russia and Georgia. President Nicolas Sarkozy has shown a flair for the high-profile diplomatic intervention. His latest success comes on the back of much-heralded diplomatic triumphs - the release of Bulgarian medical staff held in Libya, plus his role in the freeing of the French-Colombian politician Ingrid Betancourt, who was held by Farc rebels for more than six years. Much of the groundwork this time was done by French Foreign Minister Bernard Kouchner, as well as his Finnish colleague Alexander Stubb, the current president of the OSCE (Organization for Security and Co-operation in Europe). They criss-crossed from Tbilisi to Moscow, working out the six conditions that both sides could sign up to in order to end the fighting. The EU's foreign policy chief Javier Solana and other senior EU figures piled on the diplomatic pressure. Also involved was the Swedish Foreign Minister Carl Bildt, working on behalf of the Council of Europe, the international parliamentary group set up to monitor human rights. 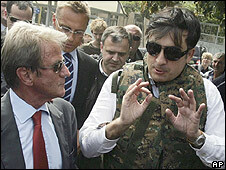 But it was left to President Sarkozy to seal the deal with high-profile visits to both capitals. There was an element of risk involved. If the talks had failed to end the fighting, or one side had ignored its obligations, the French president could have looked foolish. 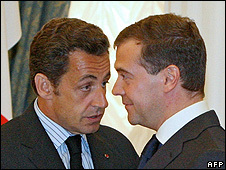 As it is, Mr Sarkozy is now being praised for his diplomatic skills. Now though the task is to turn a delicate ceasefire into a secure and lasting peace. As Bernard Kouchner told reporters after an emergency meeting of EU foreign ministers in Brussels, that will take a lot of hard political and diplomatic work. The meeting was the first chance for Mr Kouchner to present the agreement to his EU colleagues. And while it was short on specific plans for EU involvement, Mr Kouchner said it was vital that Europe - as a key architect of the ceasefire - was involved on the ground. But even as EU ministers agreed to look at the issue of sending peace monitors - pending the legal cover of a UN Security Council resolution - some doubted whether the Russians would actually let anyone in. Carl Bildt for one has his doubts. "There are no signs of the Russians letting in anyone else. I don't really see it happening. At the moment the Russians are firmly in control," he said. Nor did this meeting really get into the thorny issue of future relations with Russia - but differences of opinion between member states were obvious. The Baltic states - Latvia, Lithuania, Estonia - along with Poland, are strong backers of Georgia's drive to join the European family. They want Russia to face the consequences of its actions in Georgia, pushing for a freeze in relations. They had backing from the UK Foreign Secretary David Miliband, who argued the EU must stand by its newer members - and send Russia a message. "The international community will want to ensure that the message goes out that force is not the right way to take forward these difficult issues," he said. But others like Germany and Italy are more cautious - saying communication channels with Russia must remain open, particularly important given Europe's dependence on Russian oil and gas. Where does this leave Georgian aspirations to join Nato and the EU? On Tuesday Nato's Secretary General, Jaap de Hoop Scheffer, said the offer of membership - it's not yet specified when - still stood. But in the EU many countries are already wary of further expansion. A country that has just walked into a short war with Russia will find itself slipping even further down the list of potential candidates.